Whiskers in Wonderland provides New Yorkers with a fun opportunity to meet dozens of cats, kittens, and rabbits from area adoption organizations looking for their homes for the holidays. The Whiskers in Wonderland mega pet adoption event, presented by the Mayor's Alliance for NYC's Animals, in partnership with the Petco Foundation, features cats, kittens, and rabbits just waiting to be welcomed into new homes for the holidays. In return, these furry new friends will give the gift of unconditional love all year round! They're So Freakin' Fluffy! Get Ready to Adopt Your New Best Friend at Whiskers in Wonderland! 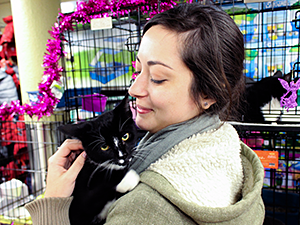 Whiskers in Wonderland, NYC's Largest Holiday Pet Adoption Event, Returns December 7 & 8! Note from the Mayor's Alliance: Are the Holidays a Good Time to Adopt A Pet? Alex and Ani Charity by Design at Whiskers in Wonderland, December 17 and 18! New Holiday Pet Adoption Event Coming in December! 'Tis the Season…To Adopt a Pet!